Jelly Jamm Rocks is a new show which started on Channel 5’s Milkshake! children's segment last week (Wednesday 15th August). Airing at 6.35am, it's aimed at 4-7 year olds and focuses on the comedy antics of the inhabitants of the musical planet Jammbo. The animated episodes explore creativity, music, fun and friendship, identifying some keep aspects of how to be kind to friends and family, and how to make others happy. The main characters are Bello, Rita, Goomo, Mina and Ongo who have many adventures on their musical and magical planet. 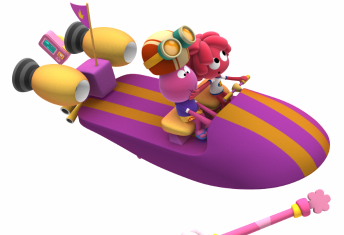 From organising a surprise party for the Queen to trying out a bathtub which flies to music, Bello and his friends embark on a series of adventures to discover their inner “Jelly”: the lifeforce of fun and creativity. We've watched one of the episodes called 'Inner Space' and it was bright, colourful and well animated. It actually reminded me a little of The Magic Roundabout in the antics and movement of the characters. Jelly Jamm airs every day on Milkshake! at 6.35am.